The master-class yesterday with Dr. Soares was thought-provoking. There were four very decent pianists. A very nervous Chinese-American guy (friend of mine) – Schubert’s Impromptu, Op. 90, No. 4 : not expressive enough.. she was trying to get him to put his body weight into the notes, put more life into them. He come off stage with frozen hands. Next: a very technically minded musicologist from Prague (an ex-roommate of mine) playing Chopin’s Ballade No. 1 in g minor, Op. 23. Form. Texture. Form. Texture. form. Texture. The beginning melody as a monophonic texture – the first note needing to set the tone for the whole piece. First note played again and again until perfection and understanding occur – everyone knows “that’s” the one. The idea is to create an intense sound from the bottom of the keyboard, to use your whole body, to use your shoulders to add weight to it.. to lean into the piece, to treat it like a heartbeat. My favorite concept from this particular segment was not necessarily particular to this piece (which I have loved for some time now and heard many, many times). Once the pianist thinks of the piece as a conversation with types of sentences: statements, questions, answers, etc… it becomes crystal clear – it becomes musical again. Then: the delicate ballet dancer (someone I’ve had classes with for years now): Souvenirs D’Andalouisie by Gottschalk. Spanish influence is immediate. The piece was played with such delicate hands – and then she made her play it… Bring the Spanish bass line in the left hand forward..use it to move the piece forward.. play it with fire, like a prima donna. The question came up in my head: When does “I love this song” sound inappropriate? When does music become a “piece”, or a “work”, and not a “song?”.. I was here for this, but didn’t take the video – such a fantastic day. My friend Catie Rodgers is the trumpet player with the wreath on her head – she’s slowly been driving her way into the brass band scene since she came to New Orleans last year from Colorado. The piece is by John Edmondson, and it was lurking inside my Queenwood ‘Developing Band Book 1″ set. My students love this piece. Of course being from New Orleans, they all have an idea of what Dixieland is. It’s always interesting trying to find music for beginning band. People mislabel things all the time. Grade 1 pieces are really grade 2 (and yes, there is a HUGE distinction), or they throw out the standardized grading system altogether and just say “easy”, “medium-easy”, etc.. and of course their definition of ‘easy’ never matches with the rest of the world’s. It’s hard to create music for beginners. They’re limited both in range and rhythm. You already know their tone quality isn’t going to be fantastic, so doing a slow piece that emphasizes tone quality won’t work just yet (although we’re trying right now with Scarborough Fair). This one does. It’s an original composition – also something rare for beginning band composers who tend to take extant works and water them down… a lot. It gives them publishing $ and credits. The piece introduces kids to some jazz techniques, which means A) It attempts to swing (we’re reading it straight for now), and B) the kids like it. It even gives all 3 of my severely-ADD percussionists a challenge. What’s the point of all of this? Preparation. I’m sitting here looking over my score to the piece, writing out my lesson plan for ensemble (which I call “Quarter Notes”, as I live in the French Quarter of New Orleans and they’re a beginning band). I feel like one distinguishable attribute of good teachers is flexibility. I can create lesson plans ’til the cows come home, and it never goes as planned. I supervise some younger undergraduates teaching a general music class of kids and within 5 minutes they look like a deer caught in headlights when the kids do something to make the script change – or worse yet, when you write a lesson plan that for whatever reason just isn’t working that day with that particular group of kids – and you need to improvise a lesson based on what doesn’t work. They never taught me that as an undergrad. You always have these mock classes with “ideal” students sitting in front of you, and eager to learn. I bring it all up because I just wrote an email to a particular undergraduate asking her if she wants to conduct the piece we chose together this week. I’m giving her 20 minutes to introduce the piece, work on it a bit, and give it to them to work on at home. (Our concert program so far looks like: Doo-Wah Dixieland, Scarborough Fair, Harrowgate Festival, Medley from Pirates of the Carribean, Ancient Voices, & Harry Potter – I’m picking 3 of those to perform at the concert. We’ll see). It will be her first time in front of the group, maybe in front of any group. I remember how that feels (it wasn’t too long ago!). My job is to prepare her in the best way possible and assist her with classroom management while she’s up there so her first experience isn’t bad. Yesterday, in a clinic with percussionist Bill Summers, some strong points came across. He treats his drums as a family, and the people playing them give voice to the family as a functioning thing. The drums themselves represent the family members: the mother (the one with the womb who speaks of wisdom), the father (the one carrying structure and discipline – the clave ), the child (the novice, the apprentice)… and that they should never be split up. Once they are – they aren’t played correctly. They have familial conversations. They have fights. They make up. They play. Secondly, he lingered on the idea of african improvisation: specifically the fact that there’s no such thing. You can always tell a “real drummer” from a hippie banging a drum… a real drummer knows the rhythms, knows the discipline, knows the rhythms for each ceremony (each morning, each afternoon, each season (much like an Indian Raga), each wedding, each funeral, each birthday)..and only plays those rhythms when appropriate. 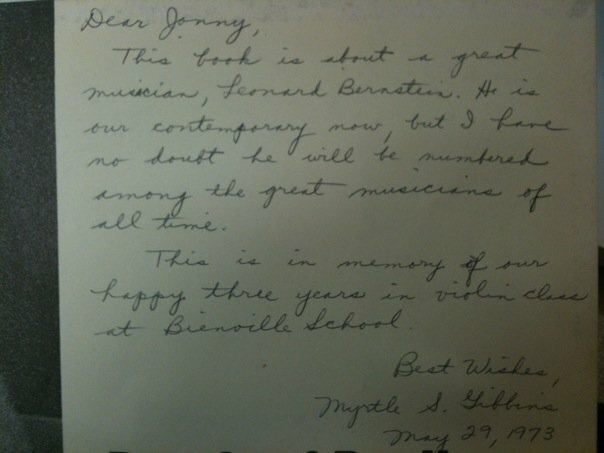 Something neat to find in a library book! Yesterday I looked in the corner of my office at the random pile of instruments (for my students) and realized I had an extra clarinet. It’s brand new, made of wood (i.e. not cheap plastic), and made by Oxford (it’s a student model). Well, I had an hour free between meetings and rehearsals yesterday and decided to open it up. Mind you, I’ve never played a single reed instrument before except in woodwind methods as an undergraduate. Even that was pretty minimal as I chose the flute that semester and watched everyone else suffer through reeds (I did bassoon for a while as part of the double reed segment). (As an aside, it’s a really odd concept to know how to teach something but not to play it). What is it that compels some of us to pick up an instrument when we’re young, and never put it down? I find myself wondering if the path I’ve taken as a musician is something I’ve done just out of habit? Out of familiarity? When I was seven, I wanted to be an author. Before that, I wanted to be a vet. Yet on the first day of 3rd grade, I walked into music class and the teacher handed me a recorder. 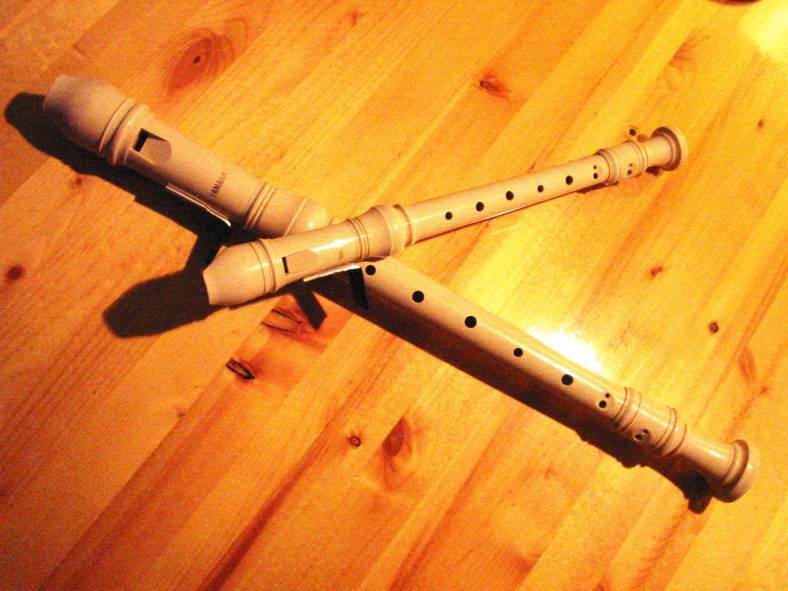 A bunch of time went by and I remember playing a recorder duet with my best friend on stage in the cafeteria. Ode to Joy (shocked?). That’s my first musical memory.